Electronically steered phased arrays have largely replaced mechanically steered antennas in the last couple decades. In an effort to eliminate the need for a waveguide rotary joint, which is both expensive and complex when built for high reliability under harsh operating conditions, Japanese engineers developed an alternative where a small subreflector is orbited about a central axis to produce a small scanning angle. The measured half power bandwidth of the central beam was about 7.5°, while the half power scan width about the main axis boresight appears per one of the plots to be around 30° or so (if I interpret it correctly). I assume this scheme was never pursued much beyond the experimental phase. Conventional scanning antennas require either a rotary joint that can be both an electrical and a mechanical weak spot or some means of varying feed line length to achieve scanning. In this article, the authors describe a simple antenna that achieves a circularly polarized conical scan at a high scanning rate. Moreover, this system appears to lack the Achilles heel of its conventional counterparts since the radiator remains in a fixed position. Many types of conical scanning antennas have been developed for homing and tracking. However, these often have various unfavorable characteristics such as a requirement for a rotary joint in the feed system or extended feeders. This research was aimed at designing a conical scanning antenna from which the usual weak points are excluded. This unit is a circularly polarized, conical scanning antenna with rapid scan rate, no rotary joint in its feed system, and as short of a feedline as possible. In addition, the bulk of the structure has been reduced considerably. 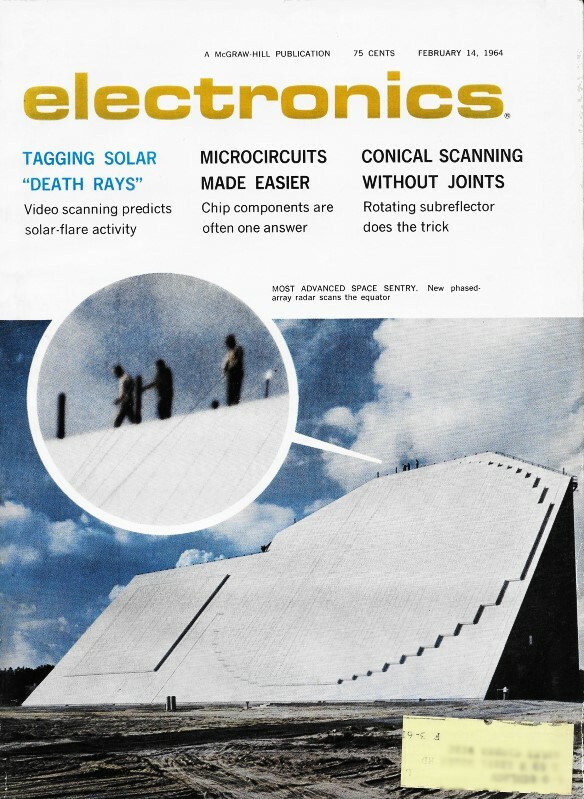 The array developed consists of a helical antenna, a paraboloid subreflector, and a paraboloid main reflector. Analysis of the operation of this system has been performed with semi-optical approximation. Operation - The antenna described is shown in Fig. 1. The paraboloid subdish is placed face to face with the main paraboloid dish at the latter's aperture. Theoretically, the focal plane E'F'G' of the sub-dish is centered in the focal plane of the main paraboloid. The focal points of both the main and sub-dish are shown as F and F. The helical antenna is designed to operate in the axial mode, and is mounted at the vertex of the main dish with its axis placed along the principal axis. The end of the helix is located relatively close to the sub-dish. Power is fed to the base of the helix through a short coaxial line. Recently developed microwave antennas with double reflectors are almost all of the Cassegrain type.1, 2 Although this antenna also has two reflectors, it is not Cassegrainian, but may be considered a modified Gregorian. Fig. 1 - Diagram illustrates method used to accomplish circular scanning. The diameter of the passive subreflector is 60 mm as compared to 280 mm for the main parabola (A), and directivity curve for the helical radiator (B). The helical antenna excited in the axial mode produces a circularly polarized wave along its axis, and the wave front can be assumed to be plane in its near field. As the sub-dish is placed close to the end of the helix, it is illuminated with a plane wave front by the helical antenna. Therefore, the wave radiated from the helical antenna is converged into the focal point F' of the sub-dish, while the focal point F' acts as the primary source for the main dish. More simply, the main dish is excited by the primary source, which is generated at the focal point of the sub-dish. An endfire antenna such as a helical excited in the axial mode has an equivalent aperture in its near field. The area of this equivalent aperture may be easily estimated from the far-field pattern of the antenna. The optimum diameter of the sub-dish should be equal to that of the equivalent aperture of the helical antenna to reduce to minimum masking and spill-over effects at the edges of the sub-dish. If the focal points of both dishes coincide, a pencil beam is radiated along the principal axis of the main dish. If the sub-dish is defocused, or rather if the focal point F' of the sub-dish is displaced by d from focal point F of the main dish perpendicularly to the principal axis of the main dish (whose focal length is ƒ), the radiated beam will be tilted by Φ radians. The relation between the defocusing angle θ = tan-1d/ƒ and the beam tilt angle Φ, and the deterioration of the directivity pattern as the result of defocusing, have been also investigated with semi-optical approximation. When the sub-dish is defocused, the phase distribution in the aperture does not remain uniform, but becomes a cubic distribution. According to calculations, the phase differences between the edges and the central point of the main dish are less than π/4 radian in the test antenna. 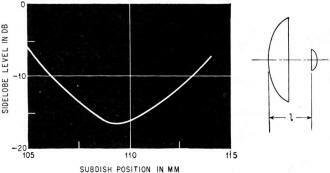 By defocusing the sub-dish and rotating it around the principal axis of the main parabola with a small motor, the focal point of the sub-dish (the primary source of the main dish), moves circularly around the focal point of the main dish. Consequently, conical scanning with a rapid scan rate is accomplished. Performance - To check the design principles, some experiments were performed. The main experiment involved investigating the radiation pattern of the antenna system in X-band. A paraboloid reflector was used as the main dish. Its aperture diameter was 280 mm and the focal length was 105 mm. The angle subtended by the dish at its focal point was about 135 degrees. This angle was thought to be appropriate for the operation of this system. A 9-turn helical antenna supported with a polystyrene rod 54 mm in length and 7 mm in diameter was used as the feed. It fulfilled the conditions for the axial mode3. The far-field pattern of the helical radiator is shown in Fig. 2A. The half-power beam width was about 45 degrees. The diameter D of the equivalent aperture of the helical antenna is estimated from the half-power beamwidth ψ, using the equation ψ = κ λ/D. By letting κ = 80 degrees (value selected at will), and with ψ = 45 degrees (measured value), and A = 32 mm, then D = 60 mm. Therefore, the diameter of the sub-dish should be 60 mm. Fig. 2 - Side-Lobe level as a function of subreflector position. Fig. 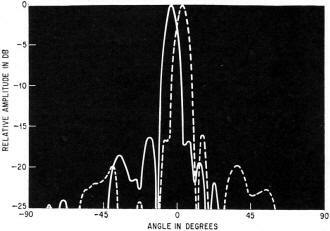 3 - Radiation pattern of the scanning antenna-angle in degrees versus the relative amplitude in db. A rod antenna excited in circular polarization may be used, rather than the helical, if desired. 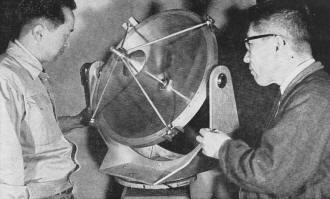 A number of subreflectors varying in diameter from 40 mm to 80 mm were used in the test. After many experiments, the optimum size of the sub-dish was determined to be 60 mm. This diameter is equal to that derived from calculations. Side Lobes - The side-lobe level of the double-reflector antenna system is sensitive to any change in the position of the sub-dish. The relation of the side-lobe level to sub-dish position is shown in Fig. 2B. The abscissa shows the distance between the apex of the main dish and the focal plane of the subreflector. The focal plane of the main dish lies at a point 105 mm from the vertex. Figure 2B shows that the position of the sub-dish that minimizes side-lobe level is a little farther from the focal point of the main reflector in a direction opposite to the vertex. Theoretically, the wave front of the radiation from the helix is assumed to be purely plane in its near field. In practice, however, it is rather spherical, and the wave radiated from the helix converges on a point outside the focal plane of the sub-dish. Consequently, the optimum position of the sub-dish is slightly farther from the focal plane of the main dish. The radiation pattern of the conical scanning antenna is shown in Fig. 3. The full line shows the pattern in the first quadrant of the conical scan and the dotted line that of the third quadrant. The half power beam width is 7.5 degrees, the beam tilt angle Φ is about 3.5 degrees, and the side lobe level is less than -16 db. The authors thank S. Mita for his encouragement. (1) p, Foldes and S, G. Komlos, "Theorectical and Experimental Study of Wide-Band Paraboloid Antenna with Central-Reflector Feed", RCA. Rev, vol 21, No.1, pp, 94-116, Mar 1960. 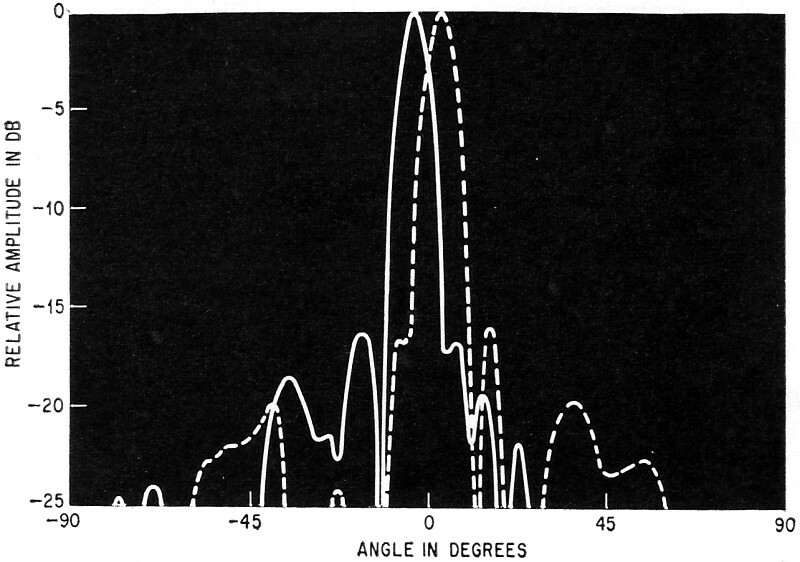 (2) P. VV, Hannan, "Microwave Antennas Derived From Cassegrain Telescope", IRE Trans, vol AP-9, pp, 140-153, Mar 1961. (3) L. D, Kraus, "Antennas", McGraw-Hill Pub Co., 1950.